Hippity Hoppity Easter....was a month ago,. Whoops. So happy #tbt to you all! Last year these limited edition cookies were plastered all over social media and they were driving all of us American food bloggers crazy because we didn't get them. (Although we get plenty of stuff other countries don't, it's just that "grass is always greener" thing we all experience from time to time in the heat of an awesome foodie moment.) This year Cadbury got the memo and realized they could make even more money selling these limited edition cookies overseas, so this Easter they were being sold at Target along with a couple other Cadbury products. I may have gone a little overboard because I grabbed two packages the moment I saw them. I mean, they're Cadbury Eggs in COOKIE form! How could that go wrong? The packaging is very reminiscent of the foil wrapped egg, we have the same color scheme, the same "splat" looking creme logo, and the classic Cadbury logo. One glance at this is all it takes to visually put 2-and-2 together and realize this is a creme egg cookie. So the branding in on point! Also worth mentioning, the package features metallic purple foil, but with a matte finish, so it photographs beautifully! Inside the foiled plastic wrapping is a plastic tray with 6 creme filled cookies inside. Since this is an imported item, baked in the UK and distributed by a USA company, the price per cookie is pretty steep. I mean this stuff is roughly $4.00 per pack! And you only get 6 cookies! For the same price you can get an entire package of Oreos, or Chips Ahoy, so for a cheapskate like me that's a big negative, but I still impulsively bought two packages. So I doubt the price tag will deter other shoppers. Besides, maybe these amazing creme filled cookies will be totally worth the hefty price tag! Ya' know, seeing these on social media when I couldn't have them made me want them even more, but now that they're here I'm feeling pretty "meh" about the whole thing. The outside chocolate layer is a little waxy and flavorless, on par with a Hershey's Kiss but with a heavier dairy flavoring, while the cookie portion is crisp, and the filling feels a little off too. 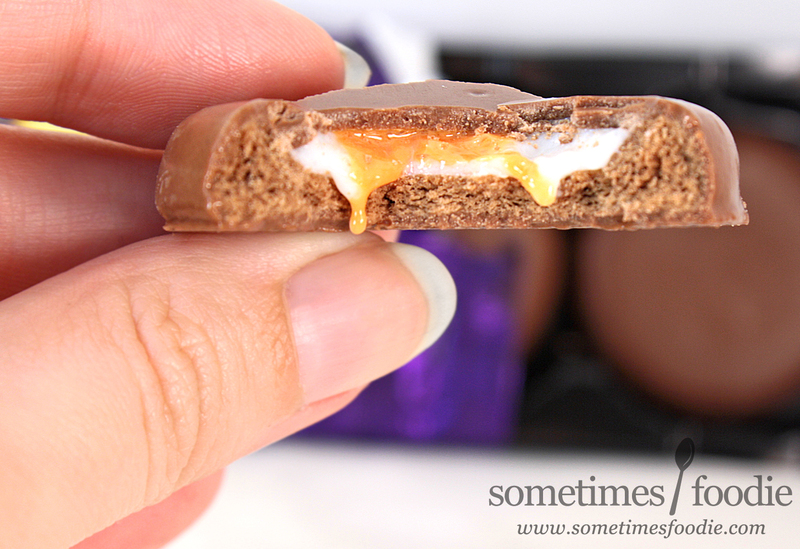 On it's own, the "creme" egg portion feels whipped in texture, but it has this odd meringue-like feel on the tongue. 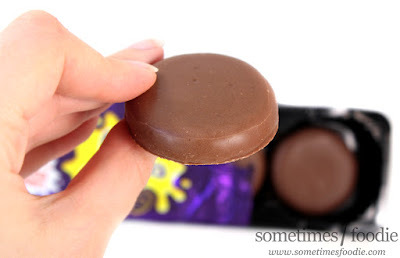 It's similar in overall flavor to the Cadbury Creme Egg filling but the texture is completely different. It's much more like the white fluffy creme in those Creme Cupcake Oreos that came out a little while ago. Plus, the coating and the cookie easily overwhelm the thin puddle of "creme" in the center when you eat the cookie all together. Overall this just tastes like some kind of knock off fudge covered Oreo. What a pity! This had such potential!